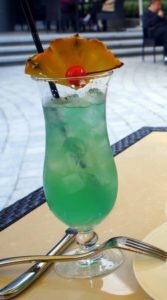 The Blue Hawaii goes back to the 1950’s and is a cocktail created by a bartender and Bing Crosby fan. Harry Yee was the renowned bartender for many tropical cocktails including the Banana Daiquiri and the Tropical Itch. As with many cocktails, this cocktail seems to have its origins in a pushy booze rep and a case of product to move. Harry appeased the salesman by mixing up a little rum, pineapple and sour mix with samples of his orange flavoured liqueur and labeled the now green coloured drink a ‘Blue Hawaii’. Note that not everybody likes Rum. We aren’t sure why, but it may be the same reason some people can’t stand cilantro. If you ever encounter someone that is reluctant to indulge in a rum-based cocktail, just swap out the rum for vodka. 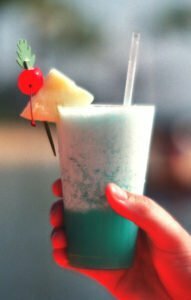 Harry was known to mix the Blue Hawaii up with all rum, half rum half vodka, or even all vodka depending on the customer’s preference. Blend until no ice chunks remain. Pour into a chilled hurricane glass, or even just a tall glass. If you don’t have a blender, or don’t want to dilute the drink… consider making this as a shake and pour cocktail. Take your rum, blue curacao, pineapple and lime juice then add to a shaker with ice. Shake vigorously and pour into a tall glass. Don’t forget to add that pineapple chunk as a garnish. The Blue Hawaiian is different from the Blue Hawaii. A simpler cocktail in some respects, and definitely not as sour as the Blue Hawaii. Garnish with the pineapple chunk. The Blue Hawaiian has a few variations. Consider swapping the 7-Up for coconut cream to add more of that holiday feel to the beverage. Blending this combination of ingredients is also an option. Note that we never would want to blend a soda beverage since it may explode in the blender. No need to waste any of that beverage sipping time on cleaning the kitchen walls and ceiling. After blending the non-carbonated drinks, just add the soda pop on top. There are so many different ways to play with the presentation of your Blue Hawaiian, all you need is some of that blue liqueur. We teach the Blue Hawaiian in our bartender training course. New rookie bartenders learn these recipes, plus 85 more, in only 2 weeks! We also teach a shaken version of the Pina Colada to ensure our students know how to make anything behind the bar.